I've been reading some of the recent CVPR 2010 papers (check out the CVPR papers on the web page to see the full list), and I came a cool video produced by Yasutaka Furukawa. I met Yasutaka when I was a visitor at Jean Ponce's WILLOW group in Paris during Spring 2008, and I was truly amazed by some of the cool geometry-based work he has done. Being a recognition/machine-learning guy myself, I can only appreciate and wonder at the amazing work produced by in-depth knowledge of geometry. In this particular case, the images aren't ones that Yasutaka collected himself. The idea behind internet-scale vision is that you can use the millions of photos on sites such as Flickr. Here is a cool video below, very much in the spirit of Photosynth. It is also not a surprise to find that Yasutaka is now working at Google. One can only imagine where Google is going to apply the "Street-View" mentality next. 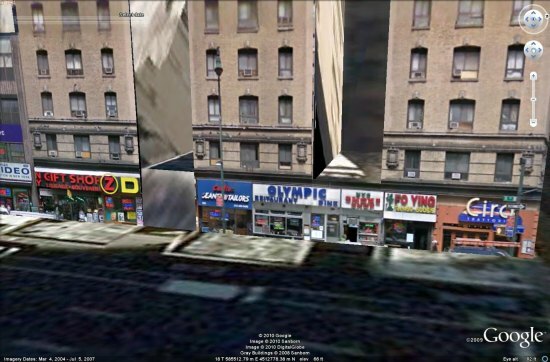 Cities like NYC already have nice high-resolution building facades, see picture below from Google Earth Blog. I want to one day run all of my object recognition experiments on Google Street view, and there is probably only a handful of places in the world that have the computational infrastructure to play with such experiments. I drool at the idea of one day building a Visual Memex from billions of online images (and this can only happen at at place like Google). Back in 2005, I remember meeting Kristen Grauman at MIT's accepted PhD student open house. Back then she was a PhD student under Trevor Darrell (and is known for her work on the Pyramid Match Kernel), but now she has her own vision group at UT-Austin. She is the the advisor behind many cool vision projects there, and here are a few segmenatation/categorization related papers from the upcoming CVPR2010 conference. I look forward to checking out these papers because they are relevant to my own research interests. NOTE: some of the papers links are still not up -- I just used the links from Kristen's webpage.